Not to be confused with the University of San Francisco or the University of California, San Francisco. San Francisco State University (commonly referred to as San Francisco State, SF State and SFSU) is a public university in San Francisco. As part of the 23-campus California State University system, the university offers 118 different bachelor's degrees, 94 master's degrees, 5 doctoral degrees (including two Doctor of Education degrees, a Doctor of Physical Therapy, a Ph.D. in education and a Doctor of Physical Therapy Science), along with 26 teaching credentials among six academic colleges. The university was originally founded in 1899 as a state-run normal school for training school teachers, obtaining state college status in 1921 and state university status in 1972. The 141 acre campus is located in the southwest part of the city, less than two miles from the Pacific coast. San Francisco State has 12 varsity athletic teams which compete at the NCAA Division II level, most as members of the California Collegiate Athletic Association. 1899 – Founded as San Francisco State Normal School. 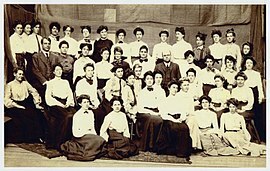 1906 – The 1906 earthquake and fire forces the school to relocate from Nob Hill to a new campus at Buchanan and Haight Streets. 1953 – Current campus near Lake Merced opens; it is formally dedicated in October, 1954. 1966 – Beginning of the era of campus protests led by student organizations including the Black Student Union, Third World Liberation Front, and Students for a Democratic Society. The protests against college policies and off-campus issues such as the Vietnam War included sit-ins, rallies, marches, teach-ins, and on several occasions led to violent conflicts with police. The protests were marked by counter-protests and widespread charges of corruption and election fraud in the student newspaper. 1968 – A lengthy student strike erupted that developed into an important event in the history of the U.S. in the late 1960s. The strike was led by the Black Student Union and the Third World Liberation Front, and it demanded an Ethnic Studies program as well as an end to the Vietnam War. This became a major news event for weeks in the aftermath of the assassination of Martin Luther King Jr. At one point, college president S. I. Hayakawa famously pulled the wires out of the speakers on top of a van at a student rally. During the course of the strike, large numbers of police drawn from many jurisdictions occupied the campus and over 700 people were arrested on various protest-related charges. 1969 – On March 20, an agreement was reached, and the strike officially comes to an end with the administration retaining control of hiring and admissions and the creation of the School (now College) of Ethnic Studies. 1994 – A mural depicting Malcolm X was painted on the student union building, commissioned by the Pan-African Student Union and African Student Alliance. The mural's border contained yellow Stars of David and dollar signs mingled with skulls and crossbones and near the words "African Blood." The next week, after demonstrations on both sides, the school administration had the mural painted over, and subsequently sand blasted. Two years later a new Malcolm X mural was painted, without the controversial symbols. 2013 – The Science Building was found to have “unsafe levels” of airborne mercury, lead and asbestos in the basement as a result of reports that pesticide-laden Native American artifacts were previously stored with a material now known to be highly hazardous. As a result of the contamination, over $3.6 million was spent for remediation of the pervasive contamination. University Administration terminated several employees who reported the contamination, resulting in several wrongful termination and whistle-blower lawsuits, including one by the recently hired director. In addition to terminating employees, the CFO at the time, Ron Cortez, hired outside consultants in an attempt to write more favorable reports regarding the contamination and to discredit the employees who had made initial reports. In July 2014, Cal/OSHA cited the university for various health and safety violations in the Science Building, which included SFSU failing to locate asbestos in the building and warn employees about the hazards of mercury. 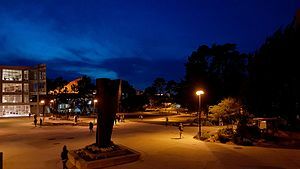 SFSU previously ran into trouble with its Environmental Health and Safety program when the director prior, Robert Shearer, was accused of taking bribes from a waste disposal firm in exchange for at least $4 million in university funds. 2017 – In 2017 SFSU excluded Jewish student pro-Israel activist groups from campus activities. In 2019 the University reversed that policy, granting Jewish student groups equal rights with other student groups. In Fall of 2013, the university had 1,620 faculty, of which 683 (or 42 percent) were on the tenure track. In addition, the university has a College of Extended Learning. SF State is on the semester system. The university awards bachelor's degrees in 115 areas of specialization, master's degrees in 97, and a doctor of education (Ed.D.) in educational leadership. It jointly offers three doctoral programs: a doctorate in education in partnership with University of California, Berkeley with a concentration in special education, and two doctorates in physical therapy with University of California, San Francisco. The most popular undergraduate majors are Business Administration, Biology, Kinesiology, Engineering, English, Communication Studies, Psychology, Criminal Justice Studies, Sociology, and Cinema. The student-faculty ratio at San Francisco State University is 23:1, and 27.1 percent of its classes have fewer than 20 students. The university is accredited by the Accrediting Commission for Senior Colleges and Universities, a subgroup of the Western Association of Schools and Colleges. The College of Business is accredited by the Association to Advance Collegiate Schools of Business (AACSB International). The School of Engineering is accredited by the Accreditation Board for Engineering and Technology (ABET) except the computer engineering program. San Francisco State is ranked the 12th top university in the United States by PayScale and CollegeNET's Social Mobility Index university rankings. In 2012 the university was ranked as the 15th best master's-granting public university in the western United States by U.S. News & World Report. U.S. News & World Report also ranked San Francisco State University 1st in reputation among its "Western University peers" in 2000. Furthermore, U.S. News & World Report ranks San Francisco State as 8th nationally in the number of transfer students. San Francisco State University's joint physical therapy master's program with UCSF is consistently ranked among the top 20 in the country. The Philosophical Gourmet Report lists San Francisco State University as one of the top eight universities to earn a terminal MA in philosophy. The Academy of Management, the leading professional association for management scholars in the world, honored San Francisco State University's College of Business' Ohrenschall Center for Entrepreneurship with the McGraw-Hill/Irwin Innovation in Entrepreneurship Pedagogy Award (2002). SFSU was one of the first California State University campuses to offer a doctorate of education. It was also instrumental in the establishment of the International University of Kyrgyzstan (1993). The university is the only one in California to offer a bachelor's degree in technical and professional writing. It is also the only university in the California State University system to offer a master's degree in Classics. In 2012, Business Insider ranked SFSU as one of the best 50 engineering schools in the world, listing Oracle, Cisco Systems, and Apple as the department's top employers. SFSU ranks 18th among the top 20 undergraduate schools whose alumni go on to be admitted to the State Bar; many subsequently run for public office. The University's College of Extended Learning offers the only American Bar Association-approved paralegal studies program in San Francisco. The Cinema Department, in the College of Liberal & Creative Arts, was named one of the nation's top film schools by Entertainment Weekly in 2000. SFSU is also listed as one of the nation's top 25 film schools by The Hollywood Reporter, having produced countless leading filmmakers, with over 13 Academy Award wins among its alumni. The Sutro Library, located within the J. Paul Leonard Library, houses the largest collection of genealogical records west of Salt Lake City. In 1969, the longest student strike in U.S. history resulted in the establishment of the College of Ethnic Studies and increased recruiting and admissions of students of color. In 2010, Forbes ranked San Francisco State as the 11th most diverse college in America, citing 51% minority students. Among 121 Western Universities, San Francisco State was ranked 6th in terms of campus diversity by U.S. News & World Report in 2013. In 2016, San Francisco State was ranked as the most diverse student body among the 100 largest American universities by Priceonomics. A dormitory building, Verducci Hall, was imploded in 1999, having sustained damage from the 1989 Loma Prieta earthquake. The school's intercollegiate athletics teams, nicknamed the Gators, compete in NCAA Division II and are a member of the California Collegiate Athletic Association (wrestling competes in the Rocky Mountain Athletic Conference). SF State fields twelve sports: men's and women's cross country, men's and women's soccer, women's volleyball, men's and women's basketball, men's wrestling, indoor track and field, outdoor track and field, baseball, and softball. SF State has produced three Major League Baseball players, of which two became All-Stars (former Mets shortstop Bud Harrelson, and former Brewers and Red Sox outfielder Tommy Harper). The soccer program has had one player enter the professional ranks. Jared MacLane played in the Professional First Division in Santa Cruz, Bolivia. The Gators have also produced thirteen National Football League players, including Billy Baird, Elmer Collett, Maury Duncan, Carl Kammerer, Douglas Parrish, and Floyd Peters. Mike Holmgren got his collegiate coaching start as the team's Offensive Coordinator in 1981. The football program ended in 1995. SF State Wrestling scored at a national championship meet every year from 1963-64 to 2016-17. In 1996-97, the Gators won the NCAA Division II National Championship. The school first adopted their mascot, the Gator, in 1931. After a call for a mascot by the student newspaper the Bay Leaf, students suggested the "alligator" for its strength and steadfastness. The students also suggested the spelling "Golden Gaters," with an "e," in reference to the Golden Gate. Students voted in favor of the name, but after numerous "misspellings" by the newspaper, the use of Gator, with an "o," stuck. KSFS is a college radio station run by Broadcast and Electronic Communication Arts (BECA) students, streaming online, at 100.7 on Comcast Cable radio in San Francisco, and at 88.1 FM near the SFSU campus mini transmitter. Manny Mashouf, founder, bebe Stores, Inc.
^ As of June 30, 2017. "U.S. and Canadian Institutions Listed by Fiscal Year (FY) 2017 Endowment Market Value and Change in Endowment Market Value from FY 2016 to FY 2017" (PDF). National Association of College and University Business Officers and Commonfund Institute. 2017. Archived from the original (PDF) on March 6, 2018. ^ As of June 30, 2016. "Money Matters". San Francisco State University. 2017. ^ "Color System | Identity System Guidelines". Logo.sfsu.edu. July 14, 2015. Retrieved October 20, 2015. ^ "Search CSU Degrees". Degrees.calstate.edu. Retrieved February 5, 2014. ^ "California State University Credential Programs : 2013-2014" (PDF). Degrees.calstate.edu. Archived from the original (PDF) on April 24, 2015. Retrieved February 5, 2014. ^ "Malcolm X Mural Is Marred Amid Dispute on Its Content". The New York Times. May 22, 1994. ^ Hoover, Ken (March 21, 1999). "1899–1999 `100 Years of Opportunity' A century and 185,020 degrees after its humble beginnings, San Francisco State University proudly celebrates its legacy of service, activism and diversity". San Francisco Chronicle. Hearst Communications. pp. SC-1. Retrieved December 10, 2009. ^ "SFSU fired whistleblower who exposed Science Building scandal". The San Francisco Examiner. Retrieved October 26, 2018. ^ "SFSU attorneys ordered to release Science Building scandal emails". The San Francisco Examiner. Retrieved October 26, 2018. ^ "Contractor Pleads Guilty to 118 Counts of Bribery Involving Former SFSU Official". sfappeal.com. Retrieved October 26, 2018. ^ Pine, Daniel (August 4, 2017). "Investigation: SF Hillel 'improperly excluded' from student fair". Jewish News of Northern California. Retrieved March 25, 2019. ^ Marks, Jonathan (March 22, 2019). "A Reluctant Campus Acknowledges Zionism". Commentary Magazine. Retrieved March 25, 2019. ^ Waxman, Laura (February 27, 2018). "SF State president apologizes for comments about Zionists". San Francsco Examiner. Retrieved March 25, 2019. ^ Asimov, Nanette (May 11, 2012). "Leslie Wong is named president of S.F. State". SFGATE. San Francisco. Retrieved August 13, 2018. ^ "2016-2017 Common Data Set" (PDF). Retrieved April 18, 2017. ^ "2015-2016 Common Data Set" (PDF). Retrieved April 18, 2017. ^ "Data Book - Academic Planning and Development - SF State". Air.sfsu.edu. June 14, 2011. Archived from the original on August 2, 2014. Retrieved February 5, 2014. ^ "CSU APPLICATIONS AND ADMISSIONS REPORTS, FALL 2012". Calstate.edu. May 14, 2013. Retrieved February 5, 2014. ^ "Fall Applications for admission Submitted via CSU Mentor : Initial Application Filing Period" (PDF). Calstate.edu. Retrieved February 5, 2014. ^ "Visit SF State - Fast Facts". SFSU.edu. Archived from the original on September 3, 2017. Retrieved September 23, 2017. ^ "San Francisco State University". U.S. News & World Report. Retrieved September 21, 2017. ^ "SF State WASC Accreditation". ^ "SF State AACSB Accreditation". ^ "SF State School of Engineering Undergraduate Programs Overview". ^ "San Francisco State University - U.S. News Best Grad School Rankings". U.S. News & World Report. Retrieved March 31, 2018. ^ "Social Mobility Index". Social Mobility Index. CollegeNET and PayScale. 2018. Retrieved October 26, 2018. ^ "SF State ranked high for ethnic and economic diversity". SF State News. September 2012. Retrieved September 18, 2017. ^ "U.S. News & World Reports Ranks San Francisco State University Top in Reputation Among Peers". Sfsu.edu. Retrieved November 4, 2011. ^ a b "SF State News". Sfsu.edu. August 25, 2003. Retrieved November 4, 2011. ^ "Best Physical Therapy Programs | Top Physical Therapy Schools |US News Best Graduate Schools". Grad-schools.usnews.rankingsandreviews.com. Retrieved February 5, 2014. ^ "Graduate Philosophy Department Ranks #8 Nationwide". Archived from the original on May 21, 2018. Retrieved May 20, 2018. ^ a b c d "Programs - San Francisco State University". Sfsu.edu. Archived from the original on December 5, 2013. Retrieved February 5, 2014. ^ "Schools & Departments". Retrieved May 24, 2018. ^ Lynley, Matt (July 9, 2012). "The World's Best Engineering Schools". Business Insider. New York. Retrieved May 17, 2018. ^ a b "San Francisco impact report". Calstate.edu. Retrieved November 4, 2011. ^ "Movie-making school". Entertainment Weekly. October 25, 2000. Retrieved September 21, 2017. ^ "The Top 25 American Film Schools 2017". The Hollywood Reporter. August 16, 2017. ^ McGrane, Sally (August 26, 2001). "Family Matters / Learning about relatives -- near and far -- expands our sense of self". SFGATE. San Francisco. Retrieved September 23, 2017. ^ "SF State Facts 2014-2015". San Francisco State University, University Communications. Fall 2014. ^ "SFSU Centennial history". Sfsu.edu. Retrieved November 4, 2011. ^ "Full List: The Most Diverse Colleges". Forbes. Retrieved January 19, 2018. ^ "SF State ranked high for ethnic and economic diversity". SF State News. Retrieved September 21, 2017. ^ "Ranking the Most (and Least) Diverse Colleges in America". Priceonomics Data Studio. Retrieved January 19, 2018. ^ "Welcome to DineOnCampus at San Francisco State University by Chartwells Higher Education". Dineoncampus.com. Retrieved November 4, 2011. ^ "Dining Center – SF State University Property Management". Sfsu.edu. Archived from the original on September 7, 2011. Retrieved November 4, 2011. ^ a b "Mary Park and Mary Ward Residence Halls – SF State University Property Management". Sfsu.edu. Archived from the original on November 17, 2011. Retrieved November 4, 2011. ^ "Towers at Centennial Square". Archived from the original on June 2, 2017. Retrieved June 4, 2017. ^ "Towers at Centennial Square – SF State University Property Management". Sfsu.edu. Archived from the original on November 17, 2011. Retrieved November 4, 2011. 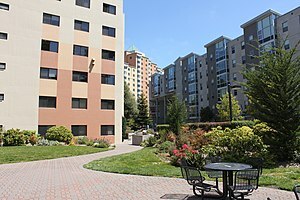 ^ "Village at Centennial Square – SF State University Property Management". Sfsu.edu. Archived from the original on November 17, 2011. Retrieved November 4, 2011. ^ Levy, Dan (March 29, 1999). "Old Dorm Reduced To Dust / Thousands watch implosion at S.F. State". San Francisco Chronicle. Retrieved January 27, 2017. ^ "Meeting and Conference Facilities- Seven Hills – SF State University Property Management". Sfsu.edu. Retrieved November 4, 2011. ^ "Meeting and Conference Facilities-Towers – SF State University Property Management". Sfsu.edu. Retrieved November 4, 2011. ^ "Sf State Downtown Campus". Sfsu.edu. February 11, 2008. Retrieved November 4, 2011. ^ "WRE | Season concludes at NCAA Regionals". SF State Athletics. Retrieved March 28, 2017. ^ "Mascot - SFSU" (PDF). Sfsu.edu. Archived from the original (PDF) on March 3, 2016. Retrieved January 12, 2018. ^ a b "SF State News". www.sfsu.edu. Retrieved September 10, 2018. ^ "KSFS Radio". KSFS Media. Retrieved September 10, 2018. ^ "San Francisco Bay Area's Bounty of Independent Radio Offerings". radiosurvivor.com. March 12, 2012. Retrieved September 10, 2018. ^ "KSFS". sfsu.edu. April 6, 2005. Archived from the original on April 6, 2005. Retrieved September 10, 2018 – via archive.org. ^ "radio Guide". baylindo.com. Retrieved September 10, 2018. ^ "Media List". City of Berkeley. Retrieved September 10, 2018. ^ "KSFS 100.7 F.M". facebook.com. Retrieved September 10, 2018. ^ "RADIO WAVES". sfgate.com. December 4, 2005. Retrieved September 10, 2018. 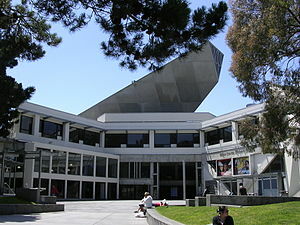 Wikimedia Commons has media related to San Francisco State University.